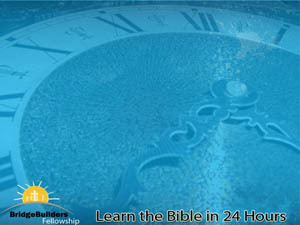 I have started teaching a series in our Sunday morning Bible class called “Learn the Bible in 24 Hours”. Here is the breakdown of the sessions. I will be posting notes from each week here, so check back to get more info and links to help in your studies. I am indebted especially to Chuck Smith and Chuck Missler for their teachings that helped shape this series.